Tesla's Model 3 will make or break Elon Musk's company. 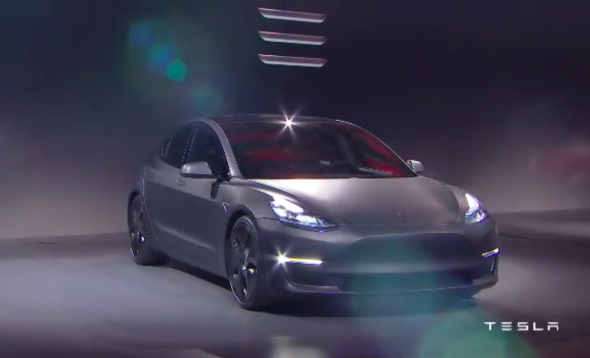 The $35,000 Model 3 is the car Tesla has been promising all along. 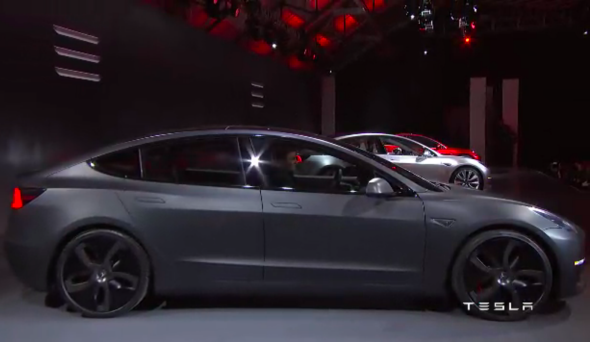 “So … do you like the car?” Tesla CEO Elon Musk asked. He was standing in front of a trio of Model 3 sedans, which the company unveiled Thursday night for the first time. The crowd at its design facility in Hawthorne, California, whooped assent. They’d better like it—because the Model 3 will make or break Tesla, both as a company and as an idea. The electric supercars that the company has made so far were all just a prelude to this: its first mass-market production vehicle, a $35,000 sedan tasked with transforming Tesla from a niche luxury brand into a major world automaker. If he’s feeling the pressure, however, Musk did not show it on Thursday night. Just after taking the wraps off the car, he announced that his company had booked some 115,000 reservations to buy a Model 3 in the first 90 minutes that it was available. That’s more than double the number of Model S sales in 2015. And the Model S was the world’s best-selling all-electric car. One caution flag: The Model 3 isn’t ready yet, and it won’t be until late 2017. So all those people plunking down $1,000 for a reservation are going to have to be pretty patient. If the benchmarks Musk announced for the car on Thursday are accurate, it could be worth the wait. It will seat five and go 0–60 in less than six seconds. It will have an EPA-rated range of at least 215 miles, again less than the S but far more than today’s mass-market electric cars, like the Nissan Leaf. That figure sounded more impressive before GM announced that its all-electric 2017 Chevy Bolt will also travel more than 200 miles on a charge, and will hit the market by the end of this year. Still, it represents an achievement that few thought possible a few years ago. Importantly, both autopilot software and Supercharger compatibility will come standard on all versions of the Model 3. That will help to preserve the aura of high-tech luxury that Tesla has cultivated with the Model S and Model X. 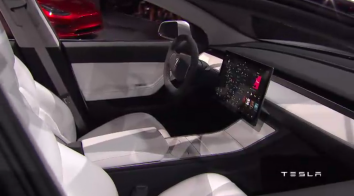 The 3 will also feature a 15-inch touchscreen dashboard display. And, yes, Musk said, it will cost $35,000. That’s not cheap. But it should be enough to place a Model 3 within reach of millions who could only dream of buying a Model S.
Oh, and the car looks pretty slick, too. Tesla’s next challenge: mass production. Musk’s presentation, like Steve Jobs’s legendary Apple launch events, was crafted to seem as though it was putting all questions and doubts to rest. And it was received with plenty of enthusiasm by attendees and Twitter pundits. Yet as promising as the car looks and sounds, and as many people lined up to reserve one, its success is still far from assured. Rolling three cars onto a stage and rattling off some performance figures is one thing. Actually building and delivering hundreds of thousands of them on time is another. And the fact that Musk is only “fairly confident” it will be ready by the end of next year suggests that there’s a huge amount of work still to be done. Much of that is likely related to the company’s vast “Gigafactory,” a Nevada facility that it promises will produce more lithium-ion batteries than there are in the world today. Then there is the question of whether all those people lining up to reserve a Model 3 today will still be as excited to buy one by the time it’s released. Don’t believe anyone who refers to those 115,000 reservations as “sales,” or even “pre-orders:” It costs just $1,000 to reserve a Model 3, a small fraction of the actual purchase price. If Chevy and others beat Tesla to market with vehicles that offer comparable range and performance for the price, the public’s hunger for the Model 3 could wane. Even so, 115,000 times $1,000 equals a healthy $115 million—not a shabby haul for an hour and a half. The sporty interior features a 15-inch touchscreen display. It is still possible that Tesla will fail to meet some of its key goals for the Model 3 and that as a result the company will lose traction with investors and the public. Those goals were always wildly ambitious, and they still are, even in light of all Tesla has accomplished so far. Production stumbles, long delays, or flaws in the design could potentially cripple a company that has staked almost everything on a single product. That said, Musk’s companies by now have put together quite a track record of silencing their doubters. If Tesla can deliver a Model 3 that looks and performs like the prototypes it rolled out on Thursday, Musk won’t have to worry about whether people will like it. He’ll just have to worry about making enough of them to keep up with the demand.